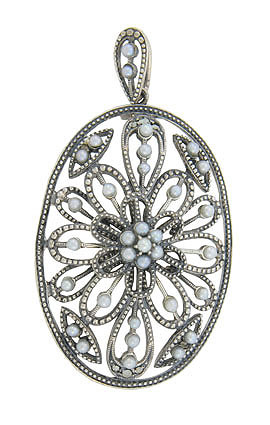 This lovely antique style sterling silver pendant-pin is fashioned as a floral filigree pendant frosted with luminous seed pearls. Distinctive milgrain outlines the entire design. The top of the pendant can hold a chain or flip down to allow it to be pinned. The pin-pendant measures 3 1/2" long, 1" wide.